The Hyatt Corporation had a 25-year-old, outdated lakeside restaurant on this property which needed to be upgraded and enhanced to support conference, meeting, and event functions. 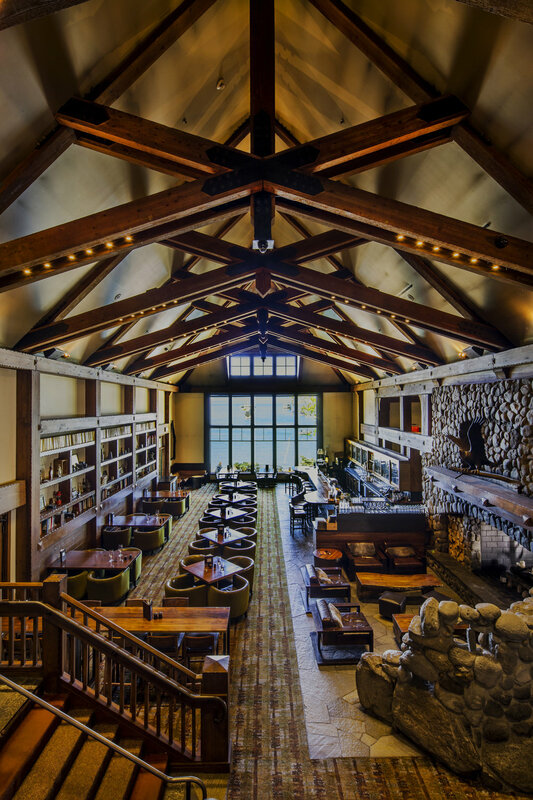 A new mountain lodge-style 6,300 sq ft conference facility was constructed along with a new restaurant/bar with both indoor/outdoor seating and with a new kitchen to support both the restaurant and conference center all within an 18,000 sq ft new building. Due to the sloping site terrain, the parking lot entry level is a full story above the lakeside level walkout restaurant and conference center. This site constraint became an opportunity to create a dramatic entry overlook to the bar/lounge and dining areas below as well as to Lake Tahoe beyond. It also allowed the kitchen to be under the entry and not to be bisected by the entry for food service flow to the conference center and dining spaces. The restaurant and conference center project was designed, drawn, permitted, and constructed within a 12-month period on a fast track basis, which included the coordination of a large number of standard and specialty consultants including food service, interior design, and lighting. Awards: Washoe County Excellence in Design; and, Tahoe Regional Planning Agency Annual Design Excellence.